The knee is encapsulated in a watertight membrane. This is true of all joints. The inner aspect of this membrane is called the synovium. The synovium has a number of functions, including that of secreting a small amount of fluid that lubricates and nourishes the joint. This fluid is called synovial fluid. When the joint is irritated or traumatized, the synovium will often respond by secreting an abnormally large amount of fluid ("water on the knee"). This fluid will occasionally make its way through the weakest part of the capsule (at the back of the knee) and this leads to the formation of a so-called cyst. Because the back of the knee is called the popliteal area, the cyst is called a popliteal cyst. These cysts are not dangerous and are in no way related to cancerous tumors. 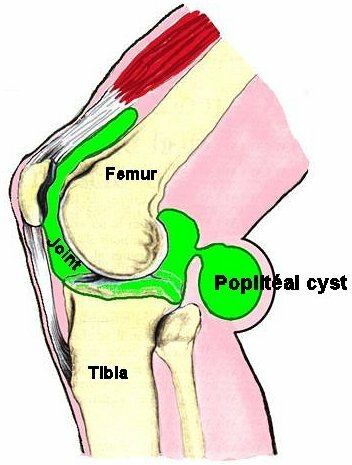 A popliteal cyst is simply a sac filled with normal joint fluid. A cyst will vary in size within a given patient, depending on the quantity of fluid present in the knee. When the cyst is small, it is asymptomatic. However, when large it can cause pressure and be a source of pain. On rare occasions, the cyst can be large enough to exert pressure on the nerves or vessels in the back of the knee, in which case the patient may feel a burning sensation down the leg, or pins and needles. He or she may also note swelling of the leg. In certain cases, the cyst can also burst. This is associated with the sudden onset of pain and swelling in the calf. The condition can mimic phlebitis or a torn calf muscle. Feeling a little bump behind the knee should immediately bring this diagnosis to mind. The bump can change in size from day to day. It is usually most obvious when the knee is straight. It can disappear outright when the knee is bent. A sonogram can confirm the diagnosis as well as identify its exact location and define its volume. This kind of cyst is usually the result of some problem within the knee joint itself. Therefore, the presence of popliteal cyst should alert the doctor to the possible presence of a torn cartilage, arthritis or other "intra-articular" pathology. Popliteal cysts will not uncommonly resolve on their own, as the fluid gets absorbed by the body or flows back into the knee joint. Since it is a completely benign condition, no other treatment is required. On occasion the cyst is large enough that it warrants aspiration and even injection of a steroid solution, which helps ""dry it up." Because the cyst is related to problems within the knee joint, the persistence of a cyst may require a surgical procedure within the knee joint itself. Direct removal of the cyst is rarely warranted since the cyst tends to recur.